Last school year I made my peace with numbers, but these days I am actually starting to feel a bit of mastery, albeit at a very elementary level. It's a long story that starts with the seeds of math anxiety that were sown as a five year old trying to count and match bumblebees on a worksheet. Over the years, it turns out that geometry is really my thing, but numbers, for the most part, give me a general and unwelcome sense of dis-ease. That is, until I became responsible for my daughter's math education. Over the last year both of us have increased our capacity for mental math, which basically means we are now able to see numbers essentially as flexible, interesting objects that shrink and expand as needed. We have developed our addition and subtraction skills mostly through games and other play and narrative approaches. For first grade we played hours and hours of UNO and many, many rounds of Shut the Box. We rolled miles of dice. We counted, earned, saved, and spent mountains of coins. My mantra was 'find your tens' and for a long time, it seemed, tens were hard for her...until one day they weren't. Now she's a pro at double and sometimes triple digit mental addition, and subtraction is not far behind. She and I have different approaches as we work toward an answer, but it's frankly just awe inspiring that I can add two, three or even four 2-digit numbers before reaching for the calculator. And my kid? I wish I had had her skills at seven -- I would have probably loved math decades sooner if I had actually been supported in developing the numeracy she already has. 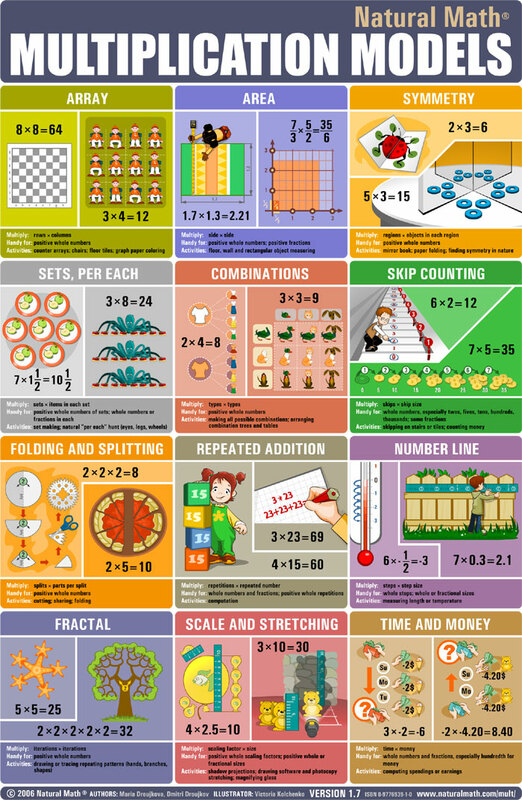 ...and then Denise at Let's Play Math wrote a fabulous post about multiplication including a section on multiplication models which included a card game she created! (It's a free pdf download and about half-way into the post.) You can play the game in the form of Concentration, Go Fish or Rummy. We spent some time sorting out and getting familiar with the different models (sets, measurement and array) and, after we played Go Fish a few times, all of a sudden the light bulb went off in my head about how I can bring those concepts of into our daily lives. I may be more impressed with myself than need be, but I mean, just listen to me as I walk my daughter through using the juicer this morning -- I actually sound like I understand what I'm talking about! Me: Do you see the 4 on the measuring cup? That means four ounces. You're going to juice four ounces which is also one-fourth of cup. When the juice gets to that line, you'll be done. Kid: That's not enough! [As I pour it into a glass that is narrower than the measuring cup.] Oh, wait. It looks like a lot less in the measuring cup. Me: Why do you think that is? Kid: Well, it spreads out more in the cup. Me: Yep. Hey, if you're drinking four ounces of juice and that is one-fourth of a cup, how many ounces make one whole cup? Me: One-fourth is one of four parts. Each part is four ounces. Kid: [Done with juice and looking at her fingers. She pulls up four fingers and starts skip counting...] Four, eight, twelve, sixteen!! I feel successful just being able to have that kind of conversation. And really, it's these kind of small steps that ultimately made last year's math work so successful. So, score one for a small moment of multiplication! 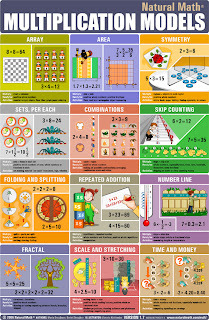 We're on our way -- and I can't wait to get the Multiplication Models poster I ordered off of Amazon from Maria Droujkova and Natural Math. It'll be great to have it around us as we find more small moments just like this one. That sounds so fun! I'm guessing your measuring cup holds 2 cups total, because one official cup = 8 ounces. Thanks, Sue! You're right and I have so much to learn... Good thing she's in second grade for the WHOLE year, lol! This is so cool. I *am* impressed! We've been doing some multiplication too, and I'm surprised to find it all over the place. We played mancala last night, and Walter used multiplication to figure out how many stones he had. 6 cups with 4 stones each.